SIRE OF THE SENSATIONAL 2 YEAR OLD TRACK RECORD HOLDER WEDDING DANCE $166,647. NOW THE WINNER OF THE $80,000 3 YEAR OLD FILLY ALBERTA SUPER FINAL. ALSO THE SIRE OF ROARING HOME. WINNER OF THE 2 YEAR OLD $80,000 ALBERTA SUPER FINAL. A RUGGED SON OF THE REAL ARTIST. A WINNER OF 29 RACES INCLUDING THE MEADOWLANDS PACE CONSOLATION, THE KEYSTONE CLASSIC AND TWO PASS DIVISIONS. WAS SECOND TO BADLANDS NITRO IN THE $500,000 BATTLE OF BRANDYWINE. SECOND TO SOMEBEACHSOMEWHERE IN THE TATTERSALLS WHERE THE "BEACH" WON IN A WORLD RECORD 1:46.4. WAS ALSO SECOND IN THE ADIOS AND THIRD IN THE LITTLE BROWN JUG ELIMINATIONS. FINISHED THIRD TO ART OFFICIAL IN THE BLUE GRASS STAKE. COMPETED WITH THE GREATEST GROUP OF THREE YEAR OLDS EVER INCLUDING SOMEBEACHSOMEWHERE, BADLANDS NITRO, SHADOW PLAY, ART OFFICIAL, MOON BEAM, DALI, ATOCHIA, RIGGINS, AND BLUERIDGE WESTERN. 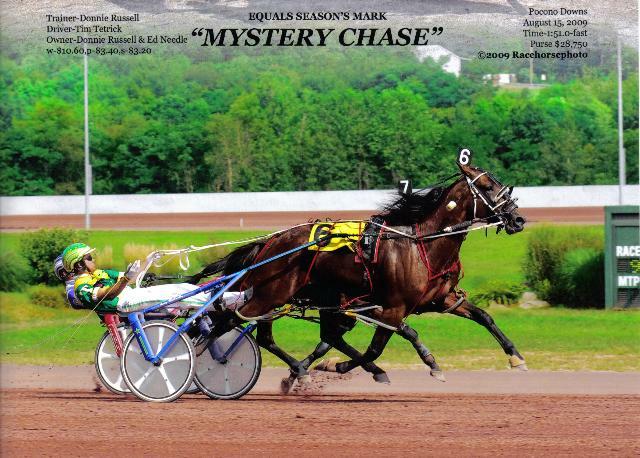 MYSTERY CHASE IS THE SIRE OF 2 YEAR OLD FILLY TRACK RECORD HOLDER WEDDING DANCE 1:54.3 $166,647, THE MULTIPLE STAKES WINNING FILLY DIVAS DRAGONFLY 1:55.2 $129,264 AND THE SUPER FAST GLAMOURS GAL 1:53.1. NOW THE SIRE OF 2 YR OLD ROARING HOME $75,650, WINNER OF THE ALBERTA SUPER FINAL. WATCH VIDEOS BELOW. SECOND IN MONEY EARNED FOR 2 YEAR OLD ALBERTA PACERS IN 2017.